Santa Clarita residents can pay less with Residential Solar Power than what they are paying right now while on the grid. Santa Clarita Solar Installation helps homeowners lower their electric bills with Clean and Renewable Energy from the Sun. Solar Power. By converting your home to Solar Energy, you can lock in a fixed electric rate that is substantially lower than the cost of electricity you buy each month from the grid. By locking in a rate, this means you are protected from unexpected high electricity bills as well as a rate increases. Many customers in Santa Clarita are paying around 25% less with Solar Energy than they were with their old electric company. Solar Power vs. Traditional Power always ends with Solar winning. When you're not worrying about your electric bill, you can focus on the more important things in life! Installation for a new Solar Energy System is not as complicated as you may think. With Santa Clarita's Licensed and Professional Installers, you can leave the logistics up to us, as you begin to plan for your Electric Bill Savings. 1. 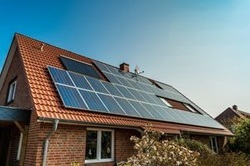 Solar Panels on your home collect DC Power from the Sun. DC stands for 'Direct Current,' which is electricity that moves in one direction. 2. DC is converted to AC via an inverter. AC stands for 'Alternating Current,' which is electricity that moves back and forth. This will allow energy to be stored in a battery and the use of an inverter allows to have AC power like a wall plug. 3. Collected power is added to the Electric Meter. This is the same meter that you receive your electric service. You will begin using Solar Energy instead of the paid electricity from a plant burning Fossil Fuels. Governmental law state that the extra Solar Energy you bring in can be sold to your Electric Provider at retail rates. 4. You now have Power to Turn on the Lights via Solar Energy. 5. Remember, you still have Utility Service if you need it.